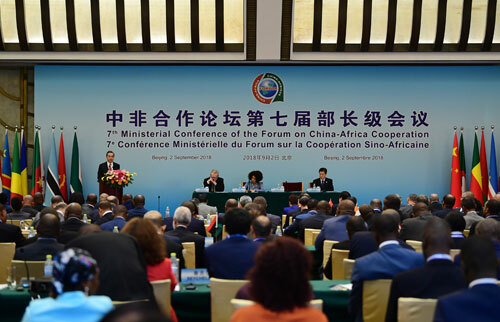 On September 2, 2018, the 7th Ministerial Conference of the Forum on China-Africa Cooperation (FOCAC) was held at the Diaoyutai State Guesthouse in Beijing. State Councilor and Foreign Minister Wang Yi and Minister of Commerce Zhong Shan jointly presided over the conference with Minister of International Relations and Cooperation Lindiwe Sisulu and Minister of Trade and Industry Rob Davies of South Africa. Foreign ministers and ministers or representatives in charge of foreign economic and trade affairs from 53 African member states of the FOCAC and high representatives from the African Union (AU) Commission were present. Wang Yi expressed that this year marks the 18th anniversary of the establishment of the FOCAC. Over the past 18 years, as an important mechanism for collective dialogue and practical cooperation between China and African countries, the Forum has enjoyed constant development and growth, becoming a model of South-South cooperation and a banner of international cooperation with Africa. Facing the new changes in international situation and the respective new development demands of China and Africa, the Chinese side will take the holding of the FOCAC Beijing Summit as an opportunity to uphold the principle of sincerity, real results, affinity and good faith and the values of friendship, justice and shared interests. The Chinese side stands ready to, together with various members of the Forum, further deepen traditional friendship, enhance unity and cooperation, and jointly build an even stronger community with a shared future for China and Africa on the basis of the Forum's precious experience accumulated in the past 18 years, so as to elevate China-Africa cooperation to new level. Wang Yi and Zhong Shan reported to the conference the implementation situation of the follow-up actions of the FOCAC Johannesburg Summit and the 6th Ministerial Conference of the FOCAC. Wang Yi pointed out that over the past three years, the Chinese side and the African side have coordinated with each other to promote bilateral cooperation for positive new outcomes while upholding the five major development concepts for China-Africa cooperation, namely the common, intensive, green, safe and open development. The two sides have adhered to equality and mutual trust, and comprehensively improved political relations. The two sides have deepened mutual benefit and win-win results, and scored fruitful outcomes from economic and trade cooperation. The two sides have expanded mutual learning and witnessed growing people-to-people and cultural exchanges. The two sides have boosted mutual help, carried out in-depth security cooperation, enhanced unity and cooperation, and closely coordinated with each other on international affairs. At present, various measures of the Johannesburg Summit have been implemented, and the demonstration effect of the FOCAC has been constantly enhanced. Zhong Shan expressed that with the joint efforts of both sides, the 10 major China-Africa cooperation plans have been implemented in a comprehensive and effective manner over the past three years. President Xi Jinping will announce China's new measures for its practical cooperation with Africa at the Beijing Summit. The Chinese side will, in accordance with the blueprint jointly planned by the Chinese and African leaders for China-Africa cooperation in the new era, work with the African side to jointly well implement those new measures, and promote China-Africa economic and trade cooperation for new development, so as to inject new impetus into the building of an even stronger China-Africa community with a shared future, and make new contributions to promoting the building of a community with a shared future for mankind. 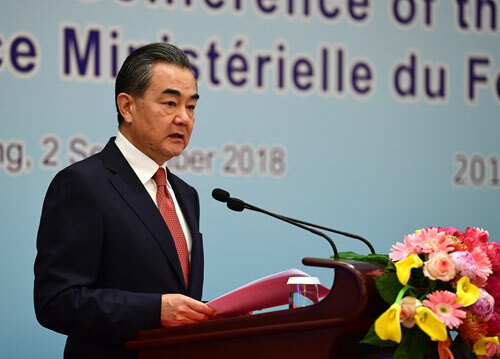 Wang Yi expressed that both the Chinese side and the African side agreed to take China and Africa: Toward an Even Stronger Community with a Shared Future through Win-win Cooperation as the theme of the Beijing Summit, which embodies the common aspiration of the Chinese and African people, and complies with the inevitable requirement of historical progress. We hope to combine the joint construction of the Belt and Road Initiative between China and Africa with the Agenda 2063 of the AU, the United Nations (UN) 2030 Agenda for Sustainable Development, and the development strategies of various African countries, so as to create new opportunities, expand new fields and open up new prospects for the development of China-Africa comprehensive strategic cooperative partnership. Wang Yi expressed that at the Beijing Summit, President Xi Jinping will, on behalf of the Chinese government, put forward the specific scheme for building a China-Africa community with a shared future, and announce the Chinese side's initiatives and measures for enhancing China-Africa cooperation in the future. Those initiatives and measures conform to the general aspiration of people of various African countries and the realistic demands of the development of the African continent, which will surely deepen China-Africa win-win cooperation and drive Africa's development and revitalization. It is believed that under the joint efforts of various members of the Forum, this Summit will become a historic event that enhances China-Africa unity and cooperation. Lindiwe Sisulu expressed that China is the most trustworthy and reliable friend of Africa. The African countries thank the long-term support and assistance provided by the Chinese side, admire China's great achievements, and stand ready to learn from China's development experience. The African countries are willing to take the joint construction of the Belt and Road Initiative, and the implementation of the Agenda 2063 of the AU and the UN 2030 Agenda for Sustainable Development as opportunities to strengthen bilateral cooperation in agriculture, education, health, science and technology, economy and trade, infrastructure construction and other fields, translate Africa's resource advantages into development impetus, and speed up the process of industrialization in Africa, so as to improve the well-being of the African people. Established 18 years ago, the FOCAC has become an important platform for Africa-China cooperation. The African countries stand ready to, together with the Chinese side, intensify coordination, jointly promote the Beijing Summit for a complete success, and draw up the grand blueprint for future cooperation between Africa and China. In their speeches, other ministers present at the conference spoke positively of the implementation situation of the follow-up actions of the Johannesburg Summit, and highly appreciated the important and long-term contributions made by the Chinese side to facilitating China-Africa cooperation. They stressed that the African countries welcome the idea of building a community with a shared future for mankind and the joint construction of the Belt and Road Initiative proposed by President Xi Jinping, and stand ready to make joint efforts with the Chinese side to deepen Africa-China cooperation, in a bid to elevate Africa-China comprehensive strategic cooperative partnership to a new level. The conference reviewed and approved the drafts of two outcome documents, namely the Beijing Declaration on Building an Even Stronger Community with a Shared Future between China and Africa and the FOCAC-Beijing Action Plan (2019-2021), which will be submitted to the Chinese and African leaders at the Beijing Summit for adoption. The conference welcomed and congratulated Gambia, Sao Tome and Principe and Burkina Faso on becoming the new members of the Forum.